This anemometer was developed from the proven A100 Porton™ instrument and R30 rotor design in response to demand for an anemometer offering pulse/frequency and analogue voltage outputs while consuming little supply current. The low power consumption, wide power supply range and choice of pulse/frequency and analogue voltage output signals make this anemometer a popular choice for use with data loggers for applications such as general meteorology and wind-power site surveying as this instrument has first class performance. A slotted disk interrupting a light beam is used to detect the motion of the calibrated R30 series 3-cup rotor and hence determine the wind speed. The internal electronics condition this pulse signal for output as a 5V squarewave and use it to generate an analogue voltage proportional to the wind speed. The A100L2 has a "secondary" analog/voltage output signal in addition to the "primary" pulse/frequency output signal, however the analog/voltage signal is less accurate (see specsheet) and we advise that only the pulse/frequency signal be used in applications requiring the highest accuracy (such as Wind Assessment). 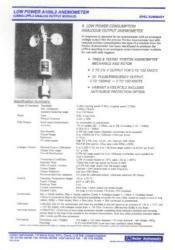 Please refer to the A100LK for a similar anemometer with pulse/frequency output signal only. Vector Instruments A100L2 Anemometers are among the very few available having Class 1 performance ("First Class") according to the requirements of IEC and MEASNET standards. 0.9% FRO (0..150Kts, at const. temp/supply voltage, rotor+ratemeter correction curve supplied). +/-2% of output (over -30..+40°C range). 3m (9ft10in) permanently attached 6-conductor* cable with braided shield/screen as standard. Longer lengths are available to order (up to 115m). Spec: Def Stan 61-12 part 4, 0.22mm²(∼24AWG). *Note: 8-conductor used for /HE4 models. Page Rendered in: 0.263594 seconds. - Powered by Mambo.